French miniaturist. He went to Paris c. 1785 where he painted portraits of the members of the royal family, including Marie-Antoinette, as well as portraits of other important personages. During the Consulate and the Empire he continued to paint portraits of Napoleon s generals and ladies of the imperial court. The celebrated miniaturists such as Marie-Anne Fragonard (ne Grard), Jean-Baptiste Augustin and Jean-Urbain Gurin are synonymous with the golden age of miniature painting in France. 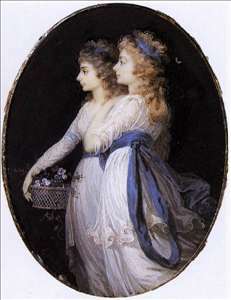 See more details about "Georgiana, Duchess of Devonshire, with Lady Elizabeth Foster"